Easy Crockpot Chicken Fiesta Bowls — Welcome to Fitty Foodlicious! Crockpot recipes are wonderful year round, but they are especially amazing during the cold winter months. My Easy Fiesta Chicken Crockpot Bowls can be whipped up in the crockpot in the morning and will be ready by the time you get home in the evening. Cook up some rice and you are on your way to a comfy, cozy, colorful meal! A few months ago my computer was running slow. So slow that a tortoise walking on the side of the road would have been faster. I searched Google high and low for what it could be and it turns out it was a storage issue. Basically, I back everything up time a thousand and I was overloading my poor iMac with too many files. I can’t help it though; in my defense being a photographer makes you hyper aware of backing everything up so we tend to get a little over zealous and protective when it comes to our files. When I finally got through to Apple chat about it they ran a diagnostic on my computer and discovered that I had over 300,000 files stored between my computer and my hard drives. 300,000 files. Yeah, that’s a lot. I went to Costco and bought a few giant 5TB storage external hard drive and backed those files up. Or so I thought. I wanted to get this recipe up for your guys since it’s easy, delicious, and healthy. I plan on re-shooting the video portion and until then at-least you have the recipe portion. This recipe has protein, veggies, and a healthy balance of carbs like refried beans and rice. I also use fresh tomatoes, zucchini, and squash. The chicken is spiced with herb’s de province, Himalayan sea-salt and freshly ground black pepper. This recipe is super easy, especially for the crockpot novice. Crockpot recipes are the best in the wintertime because you can throw everything into the slow cooker in the morning and come home to a warm meal in the evening. Dinner is done! I love making chicken recipes in the crockpot, because chicken is super easy to cook with. Add some fresh veggies and spices and you are good to go! For the rice portion of these Chicken Fiesta Bowls, you can cook any rice you want. I use Jasmine rice for everything because I love the texture and flavor. You can buy Jasmine rice for a really good price in bulk from Costco. You guys already know the other store I usually buy it from. ;) I suggest cooking the rice right before you prepare your fiesta bowls, that way it’s nice and hot. For garnish and extra flavor, I’ve used fresh cilantro (my favorite herb) sliced avocado, and Mexican shredded cheese. You could also top with additional fresh salsa if your heart desires. 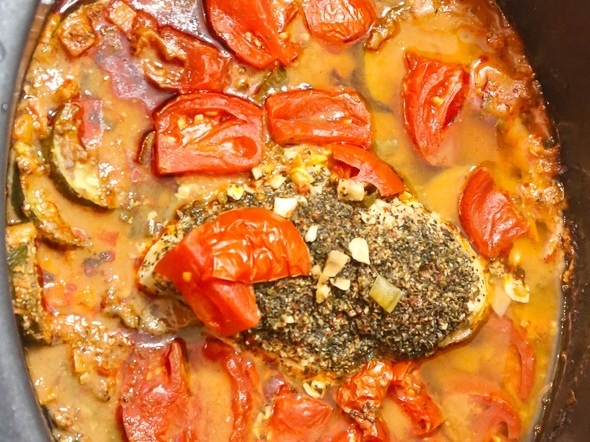 For the liquid portion of this recipe, the tomatoes do the job! No need to add chicken stock, as doing so will make these Fiesta bowls too watery. Set your crockpot to the high setting for 5-hours and come home to all the deliciousness. Tell me, have you guys ever accidentally deleted all your files? I’d love to hear all of the stories. What other crockpot recipes do you want to see on the blog? Comment below and give me the deets! Crockpot recipes are wonderful year round, but they are especially amazing during the cold winter months. My Easy Fiesta Chicken Crockpot Bowls can be whipped up in the crockpot in the morning and will be ready by the time you get home in the evening. All you need is chicken, veggies and a few fresh ingredients and you are on your way to a delicious dinner! 4-cups of Jasmine rice or cooked rice of choice. 1-bunch of fresh cilantro chopped for garnish. Place the salsa, refried beans, zucchini, yellow squash, chives, and red onion in the slow cooker and stir to combine. Coat the chicken breasts in the Herbes de Provence, freshly ground black pepper and Himalayan sea-salt and place them on top. Add the tomatoes and freshly chopped garlic. Set the slow cooker on high and cook for 5-hours. Remove the chicken breasts from the slow cooker and shred the chicken with a fork. Place the shredded chicken back into the slow cooker and stir to combine. Add in the cooked rice and top with freshly grated Mexican cheese, fresh cilantro, and sliced avocado as desired.